Who doesn’t look for comfort and durability when hunting down the perfect pair of heels? One British shoe designer has come up with a very interesting deal for women who love sky high heels and can spend a hefty chunk of change on said pair. The shoes in question may cost more than a thousand dollars but they also come with an unheard of one thousand year guarantee. Glamour reports about shoe designer Chris Shellis’ headline making heels that are made of stainless steel and sterling silver. Shellis purports that his House of Borgezie shoes are the “world’s most comfortable stiletto”. He also backs his claims that they are extremely durable with a one thousand year guarantee for women who fork over the $1,672 to own their very own pair. 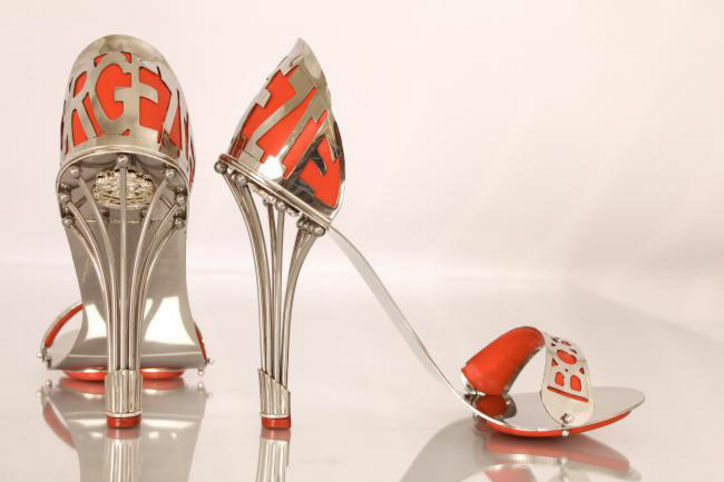 What do you think of these heels that come with a 1,000 year guarantee? What do you look for when shopping for heels? Beautiful - they look like a work of art! The addition of silicone liners on the toe strap is interesting & if it is effective - maybe this innovation will trickle down to the rest of the shoe market. Yes, the slope is key on a heel of that height, but looks like some of that silicone should also have been on the footpad. Anyway, bravo for newness!